Remember that with Bentley, you're buying access to an immense ability to customize and configure your car to your own personal taste--exercise that power wisely. 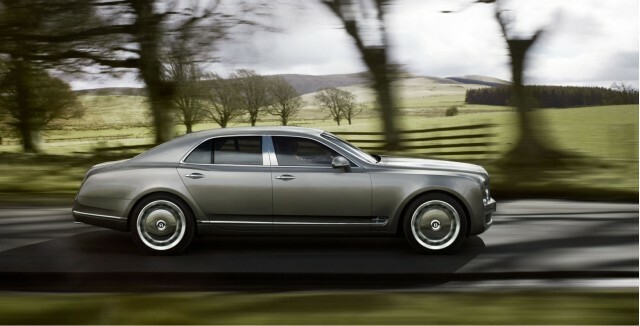 The 2012 Bentley Mulsanne delivers the height of refined luxury, power, and design--at a price. The 99 percent are getting their day in the sun, but the 2012 Bentley Mulsanne is readying itself to occupy the garages of the 1 percent, wherever they may be found. Powered by a tremendous V-8, swathed in opulent leather, wood, and real chrome, and riding the asphalt like a yacht rides the waves, the latest issue from Bentley is unapologetically elitist. Or, as Bentley's executives put it, the Mulsanne is "a big, heavy car, and unashamedly so." Despite the ready appearance of ultra-luxury, however, the big Bentley sedan is also classy and understated. It is, at its root, a hand-crafted Bentley in the most essential way. It carries forward its feature set from last year's debut model unchanged. Power, like the subtle hand-made detailing, is omnipresent and yet transparent: the 6.75-liter V-8 engine generates 505 horsepower and a tremendous 752 pound-feet of torque from just off idle. It provides force-of-nature acceleration when required, a muted roar backing the 5.1-second 0-60 mph run. Top speed is rated at 184 mph. Priced at $285,000 and up, the Mulsanne sits very near the top of the market, its closest competition coming in the form of the Rolls-Royce Phantom. With a nearly infinite list of customization and options, however, the starting price is merely a jumping-off point. Where you go from there is up to you. Nine wood trims, an array of leather colors, add-on metal trim, and upgrades including office essentials and more are all available--and all wrapped in the equivalent of 18 full cow hides. No detail has been overlooked in the Mulsanne, from the elemental to the mundane; even the iPod integration system is slick and refined. A leather-lined drawer glides out of the dash to enclose the device, then glides back in to keep it connected but out of sight. Brilliant. Unlike your typical mass-market vehicle, the 2012 Bentley Mulsanne hasn't been been rated in crash testing. Its hulking size, impeccable construction, and full-featured set of standard safety equipment, however, are sure to provide all of the sense of safety you'd want. Not that you'd be so gauche as to wreck a Bentley. Not what I expected from fathers company.